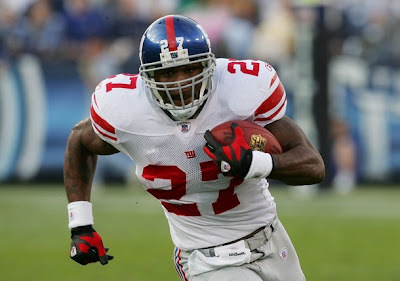 Yeah, I went with a picture of New York Giants running back Brandon Jacobs. Oh, you didn't know? He was one of the SIU Salukis' star running backs in 2004 (my freshman year in Carbondale). You also probably didn't know that he was taken after Kyle Orton. Enjoy an SIU football blog! SIU's bid for a third straight win against a Football Bowl Subdivision opponent was met with great resistance. And by great resistance, I mean Northwestern running back Tyrell Sutton. Sutton rushed for more than 100 yards and scored three rushing touchdowns in Northwestern's 33-7 victory against SIU. Saluki fans shouldn't be embarassed, for Sutton will rush for his third straight 1,000-yard season, provided he's healthy for the entire year. As for the Saluki defense, which came into the season getting plenty of positive attention, has given up 64 points in its first two games. Expect the defense to hit the weight and film rooms during the bye week, because that unit is better than what they've shown so far. Brandon Williams is still an excellent cornerback. The linebackers are still the strength of the team. The defensive line still has untapped potential. I guess that's why head coach Dale Lennon said he wasn't concerned with the Salukis' struggles on defense. As for the offense, I have my concerns. The on-again, off-again show might continue for a few weeks, especially since it is still early in the season. The Salukis are still learning the offense, but have the weapons to be a potent bunch. Larry Warner, who scored SIU's only touchdown, can still break a big one at any time. Damian Sherman is still 6-foot-4, providing rocket-armed quarterback Chris Dieker with a deep threat and a perfect pass catcher in a jump ball situation. Aaron Lockwood is still one of college football's best offensive linemen and is a good bet to be playing on Sunday's next year. Eventually, the points will come around and I expect SIU to light up the scoreboard early and often once everyone gets on the same page. Remember kids, this is Division I college football! Even if it is the FCS.